I know exactly why I go to Alaska, but I think I might have a tough time explaining it. There was the day the humpback whales visited my boat. While underway I saw a large pod of whales at a distance, so I stopped the boat well before getting to them (a legal requirement). Then, enthralled by the sight of 20 or more whales swimming about, I decided to turn off my engine and drift for a while, admiring the sight and sound of these peaceful giants. Pretty soon a few of the whales approached. One swam toward my boat, dove beneath it, and reappeared on the other side. I liked that the only sound was their breathing, and that they were obviously comforable with my being there. There was the day I happened on a black bear while hiking. I had been making enough noise so he wasn't startled, just curious. We looked at each other for what might really have been only a few seconds, but the time seemed much longer. He had the kind of amazing, beautiful, perfectly black fur one sometimes sees on a young black bear. I doubt I was as interesting to him as he was to me — I was probably seen as an intruder, capable of any outrage. There was the day I saw a beautiful aurora, a silent statement of nature's generosity. It is said that nature doesn't waste anything, that everything she does shows a brutal economy. I must tell you this is sometimes not true — I found myself struggling to absorb even a little of the beauty of that late-night celestial show. Every time I blinked I knew I had missed something important, something transient and now lost. But I know this is not why most people go to Alaska. How do I know this? I see the floating hotels (tour boats) zip by, taking their guests to the next natural wonder as quickly as possible. 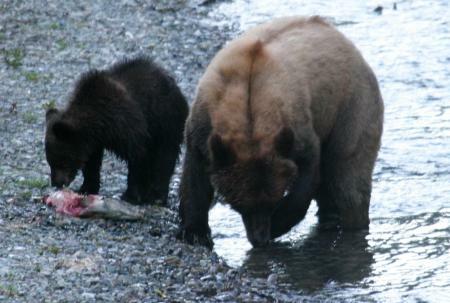 I see what once were salmon streams turned into "bear viewing parks", accessible only by permit, and the permits tend to be swept up in advance by professional guides, leaving none for those who might prefer to walk a path alone. I see people trying to package the wilderness experience, make it a safe guided tour, shorn of all risk and adventure. More important, I see efforts to turn the wilderness into a product, a predictable, reliable consumer experience, and I see this effort succeeding. Last year there was a debate in Anchorage — the tour organizers petitioned the City Council to allow the use of Segway transporters, those high-tech computerized carts, so their clients would not have to walk to get to the next natural wonder. 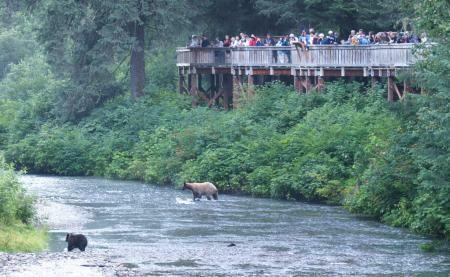 I think I know how the debate turned out — tourism is very important in Alaska, and Americans hate walking. I am especially amazed to hear people talk about the danger posed by bears. I recently saw a TV news crew interviewing a woman who expressed palpable anxiety that a black bear had been spotted in her neighborhood. As she spoke, several cars sped by unnoticed. I thought her fears might be acceptable as a meaningful test of reality only if all the cars on her street suddenly ran away and hid under bushes. This is not to say bears are harmless, but ... compared to your average driver? Please. If a bear decides to tear you to pieces, at least he's given it a few seconds' thought. That's more than the average driver is likely to do. But this rant about tourists is mostly posturing, since I am also a tourist, and a lazy one at that. After all, I could be pure — I could paddle through Alaska, carrying some camping gear and a little food in my kayak, instead of driving a big power boat that has a kayak on top for the occasional day-paddle. 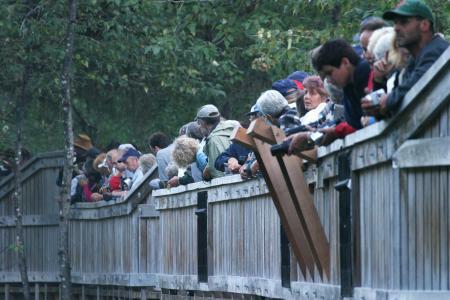 Look at the picture of the silly bear viewing area on this page, the one with the human/bear ratio of about 1000/1. I think it's ridiculous and rather funny, but ... I was there too, wasn't I?